FestPac Begins! Here’s what you need to know. The 12th Festival of Pacific Arts has kicked off at the Paseo Stadium in Hagatna! For the next two weeks, every day of FestPac 2016 will be packed with demonstrations, exhibits, performances, games, seminars and discussions featuring the finest artists, practitioners and performers from Guam and 26 other Pacific Island nations. The next two weeks will be a spectacular display of traditional and contemporary cultural practices and expressive arts in the Pacific islands. Traditional arts including weaving, carving, dancing, chanting, and seafaring will be just a few of the highlights of the festival. FestPac 2016 will also showcase literary arts including books, plays and storytelling. Fairgoers will also be able to attend forums that discuss key issues facing the Pacific islands. All of the Festival activities, demonstrations and events are free and open to the public. 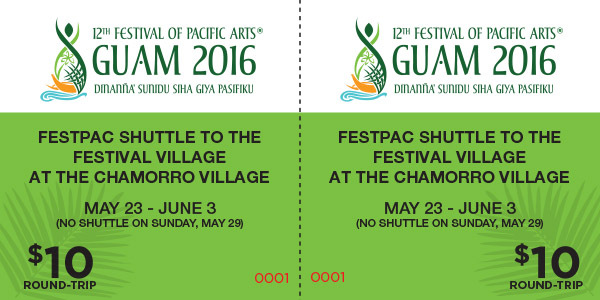 Beginning May 24 through June 3, shuttle service between Tumon and the Chamorro Village near the Festival grounds will be available in the evening for a round-trip fare of $10. Hourly bus pick up will run between 5PM and 7PM, and hourly return trips from 6:15PM to 9:15PM. Please note that shuttle service will not be available on the opening and closing days of the Festival (May 22 & June 4). If you plan on driving to the Festival, please be aware there will not be parking available at the Festival grounds. You may park in public parking spaces around the village of Hagatna, or at any of the FestPac designated parking areas including the Agana Swimming Pool, Adelup, Tiyan Parkway, and the Government House overflow parking. Shuttle service between FestPac parking areas and the Festival grounds will run every 20-30 minutes. A FestPac flag will identify the designated parking areas and shuttle stops. Visit the FestPac website at https://festpac.visitguam.com/ for more information, including maps and a downloadable Festival schedule of events. The Festival schedule can also be viewed on the free FestPac app for iPhone or Android. Find the app by searching “FestPac” in iTunes or Google Play.